Mindaugas Rutkauskas has been involved in the craft of tile-making and pottery for more than 20 years. This great artist was born on 1st January, 1956, in Kaunas. He graduated from the Faculty of History at Vilnius University in 1981. After graduation he couldn’t find a job that suited his education because of the constraints of the contemporary government (at that time Lithuania was part of the Soviet Union) so he became interested in ceramics. In an independent Lithuania, he became a member of the Folk Artists Union in 1991. The Union is a creative, independent, voluntary and non-profit organization which unites the best folk artisans from the fields of painting, sculpture, graphics, ironwork, pottery, weaving, knitting, jewellery, braiding, and traditional art. It unites non-professionals who do not have professional qualifications in the art and crafts. Today, Lithuanian Folk Art is considered to be a significant part of ethnic culture reflecting traditions and a unique perception of the world. Mindaugas Rutkauskas was given the status of ’Art Maker’ in 2007. This status is given to people whose artistic work has been positively evaluated as professional artwork and who have carried out craft activities that are recognized as professional artistic creations. Finally, tiles, jugs, bowls, plates, pots, jars and whistles made by Mindaugas Rutkauskas were certified as National Heritage Products in 2010. National Heritage Products are non-mass-produced, certified items that are made by artisans, handmade using traditional raw materials or new techniques based on old traditions while maintaining the unique qualities and composition of the products. Basically, Mindaugas Rutkauskas carries out all the major processes for the production of ceramics starting with the search for suitable clay, its cleaning and kneading, to throwing pottery and ending with kiln construction, glazing and firing. All of this is done following the principles of reproducing a craft, ie. using the same tools, materials and techniques that were traditionally used in the period of the pottery being replicated. Traditional methods are used for processes such as as clay preparation, moulding and throwing pottery, decorating, and glazing in various ranges of firing. Chemical test results are analysed; clays of different masses are prepared; copies of selected archaeological samples are moulded and fired. Mindaugas Rutkauskas spends a lot of his time studying collections and ethnographic notes in museums. He has an archaeological knowledge of cultures’ development and the different ceramic techniques of these cultures, and he analyses the patterns and techniques, and moulds and fires reconstructions of selected archaeological samples. He also reproduces the ancient techniques of Gothic and Renaissance ceramics in an experimental way, exploring and reconstructing historic stoves, by analysing the evolution of stoves and tiles, samples of tile-moulds, plastercasts and clay matrix presses. As well as his artisan activities, Mindaugas Rutkauskas also implements other initiatives relating to crafts and history. He is one of the organisers and participants of the international Bartholomew Fair which takes place every August in Vilnius. This fair showcases the replication of crafts from the late middle Ages and the Renaissance, the arts and traditions of the artisan guilds which operated for several centuries in Vilnius. 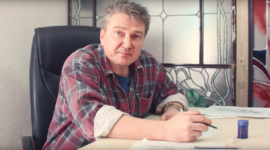 Mindaugas Rutkauskas is also one of the founders of PI “Crafts Guild” which has been operating for 13 years. It is an open workshop–gallery seeking to revive and preserve craft traditions, participating in exhibitions, education, social and cultural activities within Lithuania and in international events and projects. 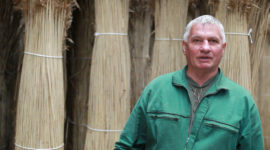 Mindaugas Rutkauskas also carries out educational activities, for example he teaches tile-making and pottery mostly to individual adults and carries out informal education programmes for children. In answering the question of whether his activities can be called a success story, Mindaugas Rutkauskas says that he is happy that he has found his ’place under the sun’ and is engaging in a favorite activity even though it does not bring significant earnings. However, money is not the objective. The goal is quite different, for instance to replace the missing pieces of tile stoves to match the original design, and if there are no illustrations available, then to restore them using his own intuition, and his historical and architectural knowledge which helps to maintain authenticity. Estoy muy interesado en conseguir algún libro sobre las casitas de cerámica de Lituania. Había visto alguna en España y este verano he visitado Vilnius, Riga y Tallin y me quedé maravillado al visitar las tidendas de souvenirs con esa inmensa cantidad de modelos de casitas de cerámica artística que he tenido oportunidad de visitar. He comprado algunas y quisiera iniciar una colección tan numerosa como mis posibilidades me lo permitan y así continuar disfrutar de tan maravilloso y bonito arte de vuestras casitas de cerámica. Desearía saber si, además de las páginas que se pueden encontrar en Internet, sería posible, si los hay, conseguir libros-catálogo de cerámica artística para poder comprar. Agradezco su atención y desde ya su repuesta. as we understood correctly, you would like to purchase a book about Lithuanian ceramic small houses made as souvenirs which you saw while visiting Lithuania, Vilnius during your trip to Baltic countries? At this moment we can sell you a book “Lithuanian Folk Pottery” by Anthony Stellaccio published in 2011. The book provides an extensive review of traditional Lithuanian folk ceramics. The first part of the paper analyses and presents context of formation of specific traditional ceramics in Lithuania in the 19 to 20th century: it characterises evolution of ceramics in both prehistoric (starting with the Neolithic Era) and various historic times. It observes that the Lithuanian traditional ceramics was affected by various and different cultures, with corresponding equivalents to be found in traditional ceramics of neighbouring countries. The second part of a paper is dedicated to various traditional forms of Lithuanian folk ceramics and their regional varieties. It refers to application of ceramic items in daily household. It then concerns specific dishes for catering, keeping and serving, ceramic items found in interior (flower pots, vases, candlesticks and toys). The third part of a paper concerns the ornaments and symbols behind Lithuanian folk ceramics, as well as specific combinations of symbols. The paper specifically discusses most common symbols of earth, heaven, water, etc. found in ceramics; these are analysed in general cultural context. The paper notes symbols of flower motives, expression of the tree of the world, animals displayed, etc. in traditional ceramics. It concludes that traditional symbols in Lithuanian ceramics shall be interpreted as determined by specific cultural glossary, as well as being archetypically universal. The fourth part of a book focuses on production technology, production means, production process and the environment of traditional Lithuanian folk ceramics. They produce and sell souvenirs. Maybe you will find necessary information. If we did not answer to you request as you hoped, please, specify it in English. We will try to help you as much as possible.